Then adhere it to card stock (I used Whisper White paper). Then adhered to the base of my card. However, do you know I actually used a real tissue!!!! Can you tell? What do you think? Today, I also brought back the "bling" with the Rhinestones! Hmmmm....maybe I added too many? But can there be too much "bling"? lol. 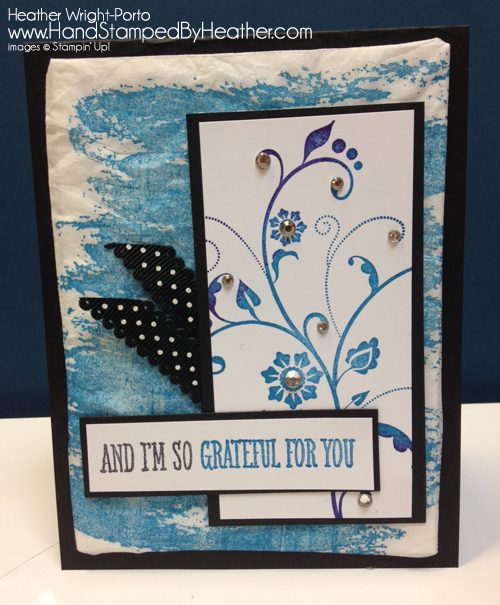 Also notice, the Flowering Flourishes stamp....it's both Pacific Point blue and Black. I first inked it entirely in Pacific Blue, then I took the Basic Black ink pad and just inked the edges (where I wanted). Since I was using a Clear Mount, I couldn't do the traditional "Rock n Roll" technique. Let's continue to check out more Faux Silk artwork! Great colors Heather! Love the way that your image turned out. Pretty card! It looks like a beautifully wrapped gift Heather. Is it for me? Hugs! Can't have toooo much bling my friend lol, finishes your gorgeous card of perfectly. Such a great take on the tissue...looks like a present. And I love bling!!! Hugs.